NASA is boldly going to Europa—hopefully. Two separate missions to send a flyby spacecraft and lander to Jupiter's ocean-harboring moon are steadily gaining steam. Today, NASA said the flyby craft, internally dubbed the Europa Clipper, has officially entered the preliminary design phase, having cleared a program milestone called Key Decision Point B. The lander also took another step toward reality earlier this month, when a team of scientists formally delivered a report laying out the mission's science goals and some overall engineering concepts. Together, the missions would attempt to discover whether Europa is habitable, and directly search for signs of life—something NASA hasn't done since the Viking missions to Mars in the mid-1970s. Neither mission is fully funded. And even in a best-case scenario, the lander mission wouldn't touch down on Europa until 2031 or 2032, meaning it could be 15 years before we know whether something is swimming under Europa's icy crust. Will the wait pay off? I spoke with two experts about this audacious pair of spacecraft, and looked into what needs to happen to make them a reality. NASA's Europa Clipper mission would launch as early as 2022 and assess the habitability of Europa, paving the way for a future separate lander mission. The first thing I learned about the Europa Clipper is that the spacecraft's name is more than a mere nod to the romantic sailing ships of yesteryear—it's an apt description of how the mission works. The radiation environment around Jupiter is hard on spacecraft, due to the planet's large magnetic field, which traps charged particles from the sun. Rather than orbiting Europa in the heart of that radiation, the Clipper will fly around Jupiter in large, egg-shaped orbits that are mostly outside the harmful radiation belts. Over the course of two to three years, the Clipper will dive into the radiation 45 times, whizzing past Europa to gather data before the spacecraft then, as Dipak Srinivasan puts it, "gets out of Dodge." Srinivasan is the RF telecommunications lead for Clipper at the Johns Hopkins University Applied Physics Laboratory. He told me the spacecraft will behave like an ancient sailing ship speeding between trade stops. After a Europa flyby, the Clipper will spend about three weeks in safe harbor beyond Jupiter's radiation, transmitting science data back to Earth. Srinivasan said these signals serve double duty: Not only do they carry mission data, ground controllers measure their Doppler shifts to pinpoint the spacecraft's location. 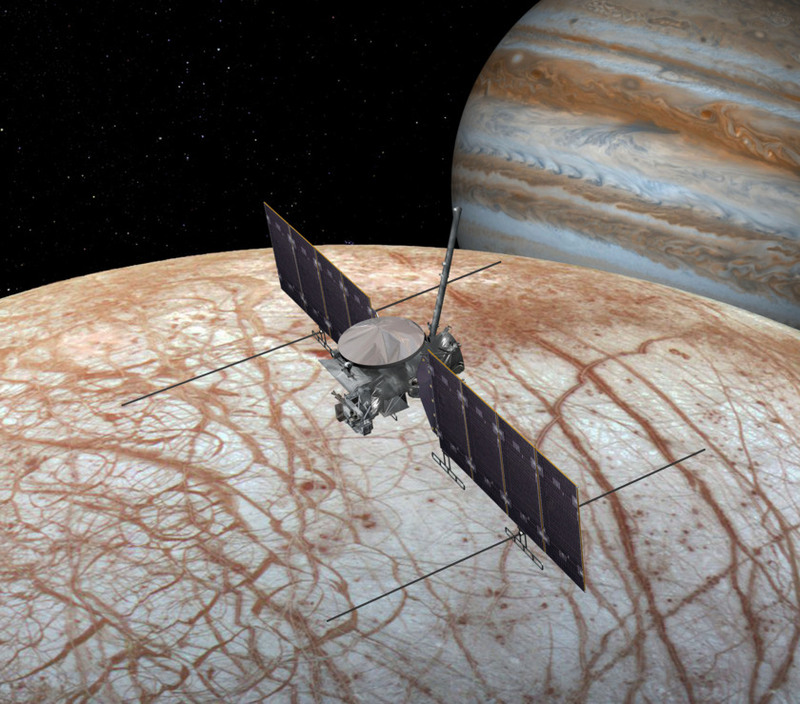 The Clipper mission's goal is to assess whether Europa is habitable. "We really want to understand the composition of Europa's interior and exterior, and see whether that composition is commensurate with what we think is required for life," Srinivasan said. Europa is slightly smaller than Earth's Moon. Its surface is an icy shell 25 kilometers thick, sitting atop an ocean about 100 kilometers deep that contains twice as much water as our own. Scientists suspect the ocean is salty, and stays liquefied because of the immense tidal forces exerted by mighty Jupiter. "Wherever there's water on Earth, there's life," said Srinivasan. "Given the fact that there is liquid water on Europa, and the fact that it's been there for billions of years, makes it one of the likeliest places for life in our solar system." During each flyby, the Clipper will scan Europa with an array of science instruments. There's an ice-penetrating radar, a magnetometer to measure the ocean's salinity, and a thermal camera to look for warm spots near the surface. Other instruments will examine plumes of saltwater that may periodically spray into space. 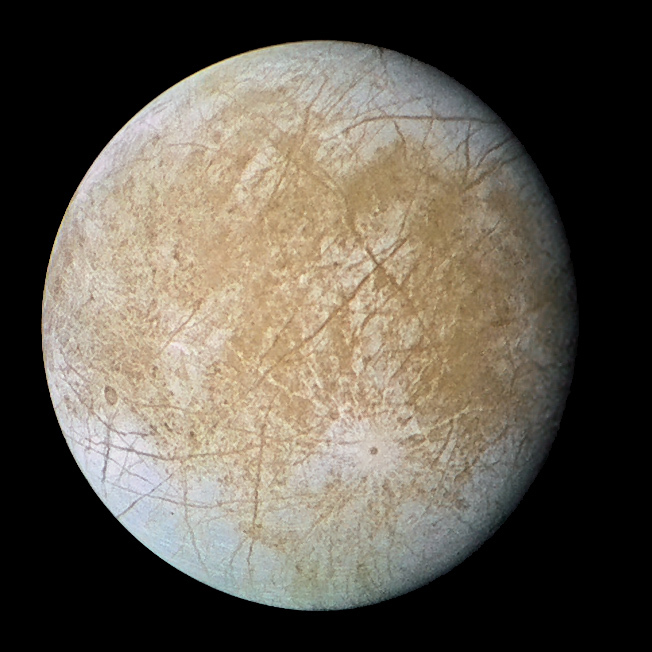 Cameras aboard the Clipper will deliver views of the surface in resolutions down to a meter per pixel; our best views of Europa so far come from the Galileo mission, and have a maximum resolution of 6 meters per pixel. The mission is being jointly developed between the JHU Applied Physics Laboratory and NASA's Jet Propulsion Laboratory. "It's kind of neat," Srinivasan said. "You have an all-star cast of people across both institutions, both of which have significant deep space experience. 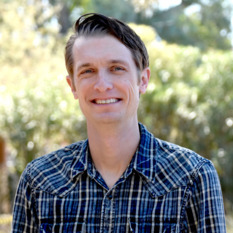 You're kind of pulling from a really, large bench and you're coming up with really clever solutions on how to make this work." The conceptual design for NASA's proposed Europa lander. In June 2016, NASA convened a science definition team, or SDT, to investigate what kind of questions a lander could answer on the surface of Europa. The SDT was also tasked with defining some of the lander's high-level engineering and instrument requirements. "Europa may hold the clues to one of NASA's long standing goals—to determine whether or not we are alone in the universe. The highest-level science goal of the mission presented here is to search for evidence of life on Europa." The implications of that goal—which was set by officials at NASA headquarters—are stunning. The agency has not directly searched for life on another world since the Viking missions to Mars in the mid-1970s. The dual Viking landers contained three biological experiments that tried to metabolize soil samples. The results were inconclusive, and in the decades since, there has been a lot of debate on how to go about detecting extraterrestrial lie. Deciding how a Europa lander would search for life was "a little surreal," said Sarah Hörst, a planetary scientist and assistant professor at Johns Hopkins University who served on the SDT. "Would this be life? What is life? It's not a conversation I normally have on a daily basis," she told me. For guidance, the team included experts familiar with subglacial lakes in Antarctica, and scientists who study extremophiles—organisms that thrive in some of the harshest conditions on Earth. The Europa lander would collect five, 7-cubic-centimeter surface samples, scraped from 10 centimeters below the surface. The samples would be analyzed with a suite of instruments, including a gas chromatograph and mass spectrometer to detect organics, a microscope system to look for microbial cells, and an ultraviolet spectrometer to characterize possible organic material. It would likely take a combination of measurements, said Hörst, to conclude life might be present. "As far as we know, right now there's not one measurement where you say, 'Okay, if we measure that, then there's life,'" she said. Since the lander's samples would only come from 10 centimeters below Europa's radiation-flooded surface, what are the chances of finding anything alive? Hörst said reconnaissance work by the Clipper spacecraft might yield younger sections of ice that have been bombarded by less radiation. Additionally, not all areas of the moon are irradiated at the same level. Europa, like Earth's moon, is tidally locked, meaning the same side always faces Jupiter. And even if the lander scoops up some life that, as Hörst puts it, is "no longer intact," there might be leftover chemical footprints showing something was once there. "Even samples that have been highly radiation-processed on Earth still retain chemical signatures that you could interpret as a evidence of life," she said. NASA officials say the Clipper mission is still on track for a mid-2022 launch. Using a powerful boost from NASA's new heavy lift rocket, the Space Launch System, the Clipper would fly directly to Jupiter and arrive in 2025. Without SLS, the journey would take five years longer, and require flybys of Venus and Earth to reach the right trajectory. Flying past Venus means flying closer to the Sun. Flying closer to the Sun means extra heat shielding. And extra heat shielding means a heavier spacecraft. Though Congress has ordered NASA to use SLS for both the Clipper and lander missions, the agency is still keeping the extra heat shielding in the Clipper's design for now—just in case anything derails development of the yet-to-be-flown rocket. Without SLS, the lander as currently designed might not be able to fly at all, according to the SDT report. That's because the spacecraft will be heavy. In addition to the lander itself, there are three other components: a carrier and relay stage, a de-orbit stage, and a descent stage. Officials aren't publicly saying how heavy the entire package might be, but it would currently require a deep space thruster burn and Earth gravity assist to put it on the correct path to Jupiter—even with the added boost from SLS. The earliest the lander would launch is 2024 or 2025, putting it at Jupiter around 2030. Once in orbit around Jupiter, the lander spacecraft would spend 18 months slowly spiraling inward to Europa, swinging past Callisto and Ganymede on the way. At Europa, the carrier and relay orbiter would separate and act as a data relay satellite. The Clipper, ideally still operating in an extended mission, would be used as a backup relay. The lander would not have the capability to talk to Earth on its own. Remember the Curiosity spacecraft's seven minutes of terror, during which it plunged to the Martian surface in a harrowing process known as entry, descent and landing, or EDL? Since Europa has no atmosphere, and the descent begins in orbit, a new acronym is in play: DDL, which stands for de-orbit, descent and landing. First, the de-orbit stage will pull the descent stage and lander out of orbit. As the thruster-powered descent stage approaches the surface, it will perform the same skycrane maneuver that deposited Curiosity onto Mars, where a tether lowers the lander. The descent stage then cuts loose and flys away for an intentional crash-landing. Once the lander is safely on the surface, scientists will have to work fast to gather their data. The spacecraft is powered only by a 45-kilowatt-hour battery designed to last between 20 to 40 days. Why not find a way to stay longer? Because the carrier relay orbiter, which will be bathed in Jupiter's radiation, is expected to fail in just a single month. Federal fiscal year 2017 began back on October 1, 2016, but Congress has not yet passed a 2017 budget. As of now, with the notable exception of Orion and the Space Launch System, NASA is operating under 2016 funding levels. In 2016, Congress earmarked $175 million for the Clipper mission. In proposed 2017 spending bills, the House allocated $260 million to be used for both the Clipper and lander, while the Senate did not mention the missions at all. One source I spoke with said NASA is internally estimating a cost of $2 billion for the Clipper alone, and that doesn't include the cost of the Space Launch System, which could have have a price tag between $500 million and $1 billion, according to statements by various NASA officials. That means that despite the progress, there are a lot of hurdles to overcome before humanity gets a chance to search for life on Europa. But NASA missions have endured far worse; look no further than the 16-year struggle to get the New Horizons mission to Pluto on the launchpad. And in this case, the end result could be a confirmation of life beyond Earth. "Just imagine if that ends up being the case," Srinivasan said. "That's transformative, to be able to say that we lived in a time when that discovery was made." Unlike an earlier proposal, JPL's 1996 Europa Ice Clipper, the present Europa Clipper doesn't clip Europa. Like Deep Impact, the mission would detach a cannonball to crash into Europa. Like Stardust, a separate spacecraft would sail through the debris cloud a moment after the impact. Bits of material freshly flung from Europa's surface would be trapped in a collector and squirreled away into a sample-return capsule. Did I mention that the mothership would be on a free-return trajectory to Earth? It never orbits Jupiter. It never orbits Europa. It just does one single flyby. I admired the audacity of the plan, which aspired to be a Discovery mission. I've found an interesting excerpt from the proposal. ...but my attempt to post a URL for the Europa Ice Clipper PDF did not work. Sorry. So this year a quarter of the budget will already have been spent. I wish they made better use of the SLS than to just speed up the transit. Boeing, Orbital and Rocketdyne promise that their SLS can deliver 25 tons to Europa with a 4-5 years trip time, using an Earth gravity assist. 25 tons is enough for multiple landers, including a Curiosity type rover. But I suppose they don't believe that SLS will ever fly, so they design a small probe that can fly on existing rockets. Radio communication should be landed as well, not orbited. On the ground one is shielded from radiation, especially if one takes advantage of the surrounding landscape or even drills down to protect the most sensitive electronics. @Arbitrary - Lesson learned from Galileo, I suppose. I assume the craft can also fit within a ~4 1/2 meter fairing inner diameter? If so you can be quite confident that they're hedging their bets on whether SLS will actually be available. SLS has a couple 4,6m ID fairing options, but the evolved fairings are massive, 7,5m and 9,1m ID respectively. If you design to that, you're in a lot of trouble if it gets cancelled. Hopefully the Clipper orbiter has a sensor to detect organics like what is on board with Dawn space probe when it found organics on Ceres' surface recently. Why?, if the orange bands on Europa contains organics and picked up by the orbital sensor, then it is the smoking gun of life aplenty in the European ocean underneath. And we all know there's more water under this Moon than our oceans on Earth! As for the lander, hopefully it then lands where the most organics are, which at the moment one would think is to land on the orange bands, which these orange materials are from the surface ocean which coloured the fractures and not land on the the white barren icy crust instead. Hopefully NASA doesn't waste money and target Europa quick and fast with a one two punch to answer life on Europa quickly and cheaply once and for all. Once life is found on Europa, don't worry, the money will keep coming from all quarters! :) Really, it doesn't have to be expensive if you target what you look for and go in quick and get the job done, which gets hard in large organisations. Although there will be some who question Barnacle's view that "it doesn't have to be expensive", he is quite possibly correct that there could be more scope to "target what (we) look for" and to "go in quick and get the job done". Also that such things "get hard in large organisations". It is the "Life on Europa" question that everyone wants answered. As Barnacle says, the orange stuff screams out, as do venting plumes if proven. So, is NASA truly thrashing all of the options enabled by modern miniaturisation, such as multiple, small plume-samplers or multiple, small impact-triggered samplers, so as to truly focus primarily on the one big question?? The expendable redundancy (yet competence) of modern miniature devices is the whole story of modern technological progress -- just look at all the iphones and think of IBM. One would think that there's just GOTTA be a highly effective way of hitting the Europa question with multiple, "cheap", disposable probes. Has US creativity really exhausted all options on this question? Also wish to point out the orange bands are spread globally on Europa where they appear on the surface fractures, so the ocean water underneath Europa's ice shell must be tainted orange red globally. We need to ask why it is orange red globally??? That means the ocean underneath this 25km very thick ice shell is not clear water but orange red water. Algal booms on Earth can be orange red, but perhaps little to no sunlight can reach 25km down. However, life on deep ocean are often red, as red light does not reach ocean depths. See link below: http://oceanexplorer.noaa.gov/facts/red-color.html There may be non-biological reasons for the surface cracks oozing these orange red substance from the ocean depths but it must also be manifesting this gloablly as well if non-biological. We just need to target these orange substance, sample them and find out. We don't need a fleet like we have for martian exploration to learn more about Mars bit by bit and waste money, just go in quick and dirty and get the job done, we don't have unlimited budget at NASA. We need the space probes to be radiation proof where they are at Jupiter though. If India can explore Mars cheap and quick with its Mars Orbiter mission compared with NASA budget, and China is talking about 2020 mission as techo demo for sample return in 2030s, while NASA 2020 rover is caching rock samples with no indication how to retrieve these cached rocks back? Why bother? Why wasting money and stretching this out for more decades and beyond? Target them, go in and out quick and dirty, nothing fancy, get the job done in OUR life time. Agreed: "quick and dirty, nothing fancy, get the job done in OUR life time." To achieve that, multiples of cheap probes (with anticipated significant failure rates) seems like it might be the way to go. Also agreed that $ will then spout readily if any suggestion of life is found. I thought that there was a Europa lander mission for which it was illegal for NASA not to do?